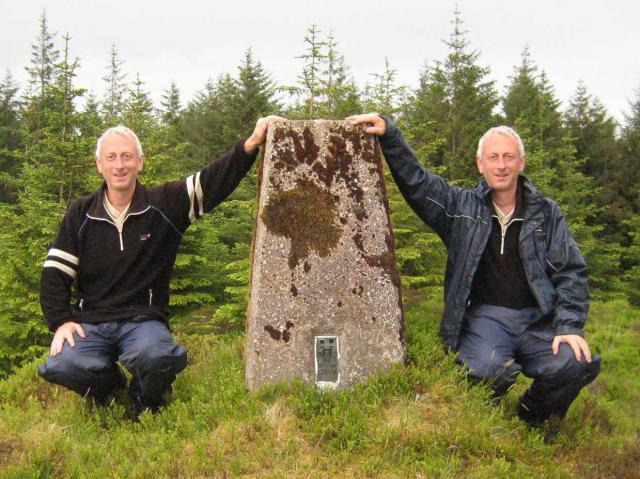 Is ranked joint 2718th with 33 other trigs (more). HISTORY: Pillar completed 14th July 1949 costing �19.5s.0d. 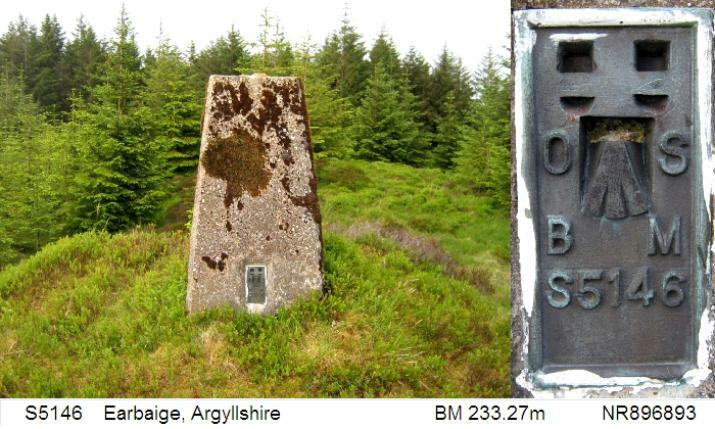 Computed as secondary triangulation station NS29/29 within the Greenock block during 1952. Levelled for height in 1955. Last maintained by the OS in June 1981. SITE VISIT: Parked in widened forest entrance by A83 at NR918896. Followed forest track to NR902888 and tried to follow mapped break. This steep climb involved a coniferous branch whack on spongy ground stepping on moss covered rotting downtakings and breaking through to occasional shin deep pools. 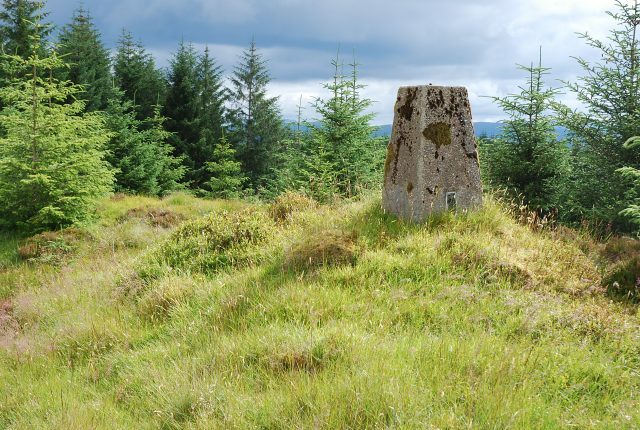 Once on the `summit plateau` the tree density was thinner but this was counterbalanced by the deep tussocks and unexpectedly stepping into grass covered thigh deep pools. 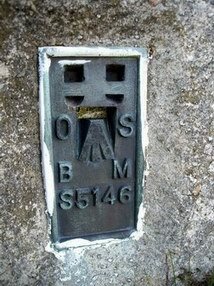 Eventually resorted to using GPS and compass to locate the trig point and found there was still over 400m NNE to slog. Pillar completed 14th july 1949 costing �19.5s.0d, still in good condition. Spider centre plugged with tar. Flush bracket faces 225� (SW). Vented through NE sight hole, SW breaking open. Partial view through trees from south through west to north but easterly half totally blocked by the conifers. Decided to decend via the east side which was slightly easier arriving back on a forest track at NR902894. 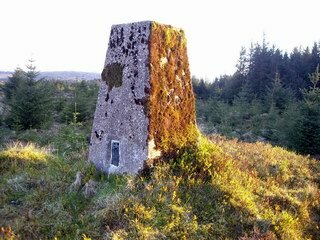 Moss covered trig with asphalt plug, surrounded by young trees contrary to what the maps suggest and therefore not so easy to find and will become more so as the trees grow. Accessed the trig from the route as Saginavinalis described it. vgc, asphalt plug, on knoll 90m SE of a well defined track which leaves forest road at NR889888. Surrounded by young spruce, not dense. Nice walk, decent view. 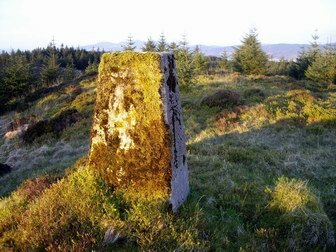 Pillar with only remains of white paint on summit approached via forestry roads and tracks from Lochgilphead Hospital. Weather showery so trees afforded useful shelter.